Welding information-management systems gather data in real time from the shop floor, right from the welding machines (semiautomatic or robotic) to provide management with a live look at every welder and welding cell. Data can even move to the cloud (Internet or intranet) to allow for remote review over the Internet. Managers can keep a close watch over numerous productivity-related metrics, such as arc-on time and weldmetal-deposition rate. Supplier-fabricators can use the systems to automate the preparation of documents they need to deliver to their customers, and alleviate welders from having to spend time logging data. And, large companies can centralize their welding-knowledge base. They can develop standard welding procedures based on application specifics, and push those procedures out to their weld cells or to the weld cells of their suppliers. Wondering how often welders (human or robotic) have to stop what they’re doing because of excess spatter or poor penetration, so they can evaluate and solve procedural issues? Welding-information-management systems will provide that knowledge as well, and allow shops to immediately identify and address common causes of downtime. Operations managers use welding-information systems to seek opportunities to increase productivity while maintaining quality. They can identify which operators are the most productive and which may need additional training, measure true welding costs, discover opportunities to reduce costs and gauge the impact of continuous-improvement initiatives. With welding data-management systems, managers can keep a close watch over numerous productivity-related metrics, such as arc-on time and weldmetal-deposition rate. Miller Electric introduced its Insight Centerpoint version 9.0 at FABTECH, which include a Smart Part Tracking feature that automatically calculates the amount of weld metal required based on an operator-input weld symbol and fillet size. Quality-assurance engineers can trace weld performance and, should welds fail, determine what changes are needed to prevent future issues. And, they can find which welders are operating outside of acceptable limits and prevent future occurrences. Service and maintenance technicians who need to keep track of all of the machines in their fleet can instantly identify what each machine is doing. If a machine experiences hiccups, the information-management system can alert technicians so that they can provide quick and accurate diagnoses. And, welding engineers can use these systems to adjust and optimize a welding process for a given application, test it, and then download the updated parameters to one or more machines in the shop. Welding-Process Insight from Miller Electric Mfg. Co. In addition to alerting production managers to under-performing welding cells, an information-management system can allow companies to establish performance baselines and quality metrics. For example, Miller has developed its Welding Intelligence systems to collect data from several models of the firm’s power sources. The data can transmit via a wired Ethernet connection or through built-in Wi-Fi capability, which allows for quick, easy setup and flexibility on the shop floor. With the Insight Centerpoint system, data stores onsite, while the company’s Insight Core system routs data to the cloud for storage and analysis. Insight Core monitors, collects and rapidly transmits electronic weld data to any web-connected device, whereas Insight Centerpoint is an advanced solution that provides real-time operator feedback and process control. And, as described at FABTECH last November, ArcAgent, part of Miller’s recent acquisition of Impact Engineering, allows customers with mixed power-supply fleets to implement its welding-information solutions on non-Miller machines. • Smart Part Tracking, which automatically calculates the amount of weld metal required based on an operator-input weld symbol and fillet size. • Standard AWS weld symbols, which help save production and planning time as compared to previous versions that required symbols to be created individually by the user. With the data from individual welding machines safety stored, management can track and assess how individual machines are performing compared to various departments or the company as a whole. Both the Insight Centerpoint and Core systems provide a comprehensive main dashboard that allows management to see a composite overview of the welding operation. Among the performance indicators available: machine-status indicators (active or idle); arc-on-time and weld-deposition comparisons and performance relative to goals; and number of welds inside and outside of quality limits. Users can track these indicators by the hour, day, week or month to identify high- and low-productivity periods. 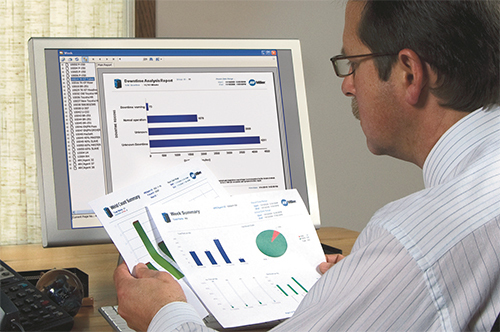 Other dashboards provide graphical displays of productivity and quality. The quality dashboard tracks the number or percentage of welds made within preset acceptable limits for arc voltage and amperage, date-stamps every weld and identifies if quality risks have increased or decreased over a period of time. Managers can even use the collected data to gauge the effectiveness of their welder-training programs. 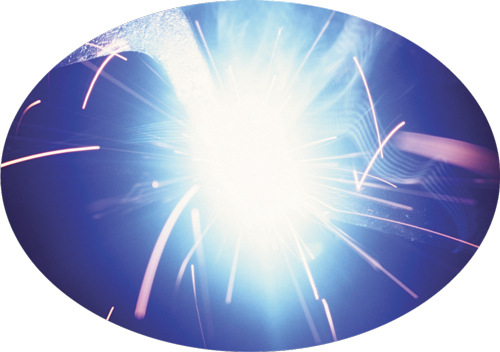 Compared to Insight Core, Insight Centerpoint delivers more advanced process-control information to the weld cell to help welders manage their processes. Among its unique modules are Part Tracking—a visual HMI that guides the welder through the weld sequence to prevent missed welds; and Work Flow—nonwelding instructions via images, audio and video to help with tasks such as fixture loading and part packaging. And it offers more advanced business-intelligence tools such as OEE reporting and a cost calculator. Last April, Fronius introduced its WeldCube, a documentation and data-analysis system that connects as many as 50 welding power sources to enable accurate and continuous quality assurance and evaluation of countless parameters. Based on an industry PC with integrated software, the system is compatible with all digital Fronius machines, including the firm’s DeltaSpot resistance-welding system and with its TPS/i intelligent welding-device platform. This enables the user to document and evaluate data, including weld current and voltage, wire-feed speed, welding speed and time, arc and dynamic correction, and job numbers. Users also can continually monitor and evaluate consumption data relating to gas, wire and energy, for example. Set values, such as job data, can be observed and recorded by the system for the entire service life of a welding system. When used in combination with Fronius’ new TPS/i welding-device platform, users can edit jobs and make comparisons across power sources. Lastly, Fronius offers a host of analysis tools to enable timely and reliable troubleshooting. Continuous data analysis can prevent production downtime and increases safety. Making its debut at the Esab FABTECH booth was the new WeldCloud online welding-data management system. It combines 3G mobile-communications technology with Wi-Fi, Bluetooth, GPS and Ethernet to allow users to alleviate firewall and connectivity issues. Running on a company’s intranet cloud, WeldCloud is a secure, locked-down system that ensures that data remains totally confidential. Esab introduced its WeldCloud online welding-data management system at FABTECH, combining 3G mobile-communications technology with Wi-Fi and Ethernet to allow users to alleviate firewall and connectivity issues. The system runs on a company’s intranet cloud, and since it uses open-source software, it’s easily customized. • Traceability. The platform can trace back to welds that already have been created, and provides the details on how and when they were created. Details include welder qualifications and the type of filler metal and shielding gas used. • Complete documentation of filler metals, consumables and operator qualifications for individual projects. At FABTECH, Kierkels showed how easy it was to add a bar-code scanner to the system, as an example of how a weld shop can document all of the equipment and personnel used to complete a project. • Monitor and act upon productivity reports. • Share and analyze data by teams across multiple data-collection sites. WeldCloud integrates with ERP, MRP and other shop-management software packages. 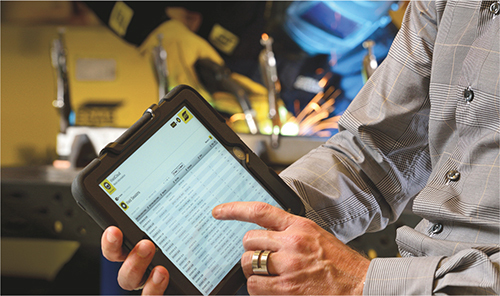 Here, adds Esab’s global director of strategy Anders Lindh, is where a welding data-management system can move fabricators toward an Internet of Things (IoT) environment. Lincoln Electric’s CheckPoint production-monitoring network provides much-needed traceability reporting–which can be accessed in full reporting from a PC or in abbreviated form from a mobile device. This allows fabricators to create records for customer review on welding-consumable certifications, and maintain records for quality initiatives and other similar activities. Lincoln Electric’s cloud-based production-monitoring network, CheckPoint, lets users obtain performance information on their welders and welding operations located in single or multiple locations from any computer or mobile device via Wi-Fi, without the need for specialized software or IT hardware. Users can view the live status of each welder as it sends status updates to CheckPoint during and after each weld. It also employs a proprietary calculation to determine when each welding system will run out of consumable wire, and offers other weld details such as wire-feed speed, voltage and more. 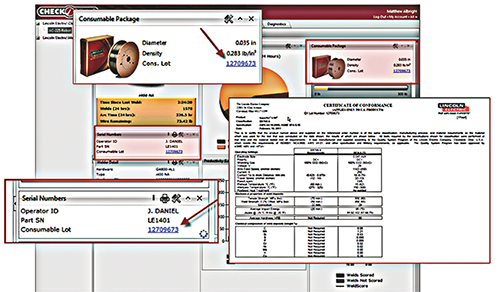 Users can search welds via operator ID, consumable ID and part serial number, and also choose tailored reports and analyses. Welding is an ideal production process for a production-monitoring network of this type, according to Joe Daniel, software development manager at Lincoln Electric. In addition, the network captures audit-trail data to satisfy reporting requirements for ISO, Six Sigma, statistical process control, quality cost delivery, lean manufacturing and other quality initiatives. Of particular benefit is calculation of OEE. Combining such capabilities with cloud storage further enhances production monitoring in general, and the CheckPoint network in particular. Accessibility to customized data and reports is another convenient benefit of CheckPoint’s cloud architecture, according to Daniel.